Over the weekend we made the 4 hour drive down to Summertown, Tennessee for our 6 week checkup at The Farm. We got to stay in our midwife’s cabin again, the same one Everly was born in. I had her right there on the floor where the rocking chair is in this photo. Ah, the memories. We had some playtime upon arriving at the cabin. We figured letting Everly stretch out on the bed would be a nice change from being cramped in the carseat all day. E had fun playing as you can see in the above photos. We learned that an increase in humidity impacts a baby’s bottom. Poor Everly got kind of rashy while we were in Tennessee so we put a potty pad (left over from the birth kit) under her and let her go naked for a bit. She liked being free but was also startling much more without clothes on. The fresh air and sunlight did help with the rash though. The checkup went well and Pamela was very excited to spend time with Everly as you can see. You can read more about how the checkup went in this post. We had a great time on our trip, it was a time for us to reflect on Everly’s birth and we also made some good memories while we were there. That’s beautiful! I’m glad you can go back there and revisit. Pamela looks like one of those lovely, warm heated ladies! Everly is looking very well and alert! What a beautiful baby! Happy WW! .-= ali´s last blog ..Wordless Wednesday: Shopping For My Next Coffee Mug =-. I love pictures! E’s getting so big! I am so glad you went for what you wanted and made such good memories for Everly’s birth. She is such a cute baby, love the smile on her face looking up at N.
Everly is such an adorable baby. She looks much older in the pic where she’s smiling at N, but then I look at the one where she’s snuggled into you and realize how tiny she still is. I’m glad everyone is doing so well! What beautiful pictures, Everly looks so precious and the midlife looks so warm and kind. Happy WW! 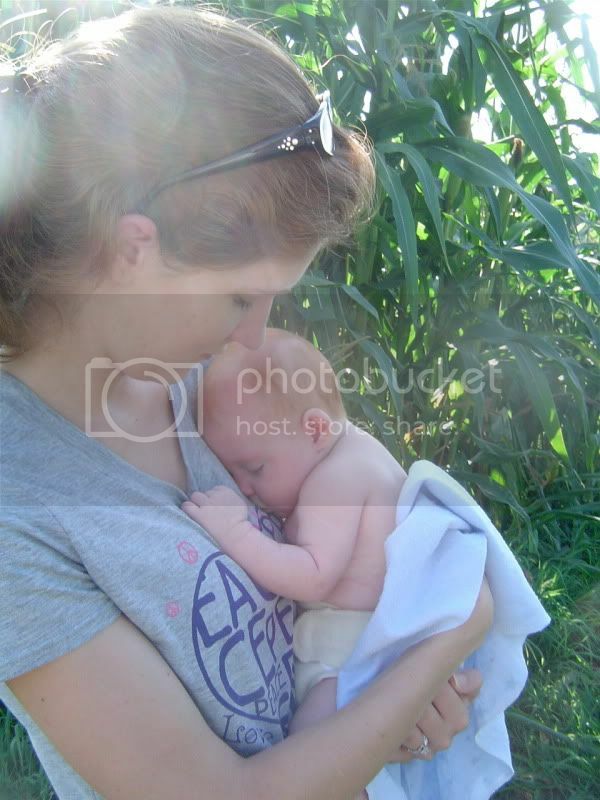 .-= homemom3´s last blog ..Wordless Wednesday: Sizzix =-. Love the pictures! Just adorable. If you notice Everly getting startled and waking herself up from sleep, I highly recommend a sleep positioner. That’s what we had to use for Colten because his startle reflex had him only taking 2 little naps during the day as a newborn and then he was too overstimulated. It worked wonders! The sleep positioners are made of foam and have a slight incline which also helps with any acid reflux/tummy issues.